February 2019 - Updated as part of review. April 2019 - Administrative amendment to formatting. Risk is the ‘effect of uncertainty on objectives’ where effect is a deviation from the expected outcome. Risk may be caused by a single event or a set of circumstances that affect, adversely (threats) or beneficially (opportunities), the achievement of objectives. In the context of risk management, uncertainty exists when there is an inadequate or incomplete knowledge or understanding of an event, its likelihood and/or its consequence. Risk management refers to the set of principles, framework, culture, processes and coordinated activities to direct and control an organisation with regard to the many risks that can affect its ability to achieve its objectives. Effective risk management increases the likelihood of achieving objectives, identifying and pursuing opportunities and avoiding or minimising unexpected harms. Financial Accountability Act 2009 (Qld) – requires the establishment and maintenance of an appropriate system of risk management. Financial and Performance Management Standard 2009 (Qld) – prescribes that UQ's risk management system must provide for mitigating the risk to the University and the State from unacceptable costs or losses associated with the operations of the University, and managing the risks that may affect the ability of the University to continue to provide services. Higher Education Standards Framework (Threshold Standards) 2015 – requires that risks to higher education operations are identified and material risks managed and mitigated effectively. Crime and Corruption Act 2001 (Qld) – refers to corruption risks and development of prevention strategies. Work Health and Safety Act 2011 (Qld) – requires that risks are eliminated, and if not reasonably practicable to be eliminated, then minimised as far as reasonably practicable. contextual (i.e. risks are assessed against specific objectives) and recognises that uncertainty could affect objectives adversely and/or beneficially. The development, enhancement and protection of its strategic and operational capabilities. UQ’s Enterprise Risk Management Framework (ERMF) provides the overall framework, direction and oversight for the systematic, disciplined and consistent identification and assessment of risks (including opportunities) and for their effective and efficient management. The ERMF comprises this policy, Senate and management commitment to effective risk management, people and relationships that enable a risk‑aware culture and the objectives and strategies that provide the context for risk assessment and management. An enabling management function, supported by input from staff at all levels, dedicated to the achievement of UQ’s strategic and operational objectives and priorities while operating within the Senate-approved risk appetite and tolerance levels. Senate’s expectations and risk appetite. Management/ leadership commitment and support for risk management function, organisational culture and relationships. External compliance obligations relating to risk management. Risk management objectives, strategies, mandate and accountabilities. Risk management resources, plans, processes and activities. The ERMF applies to all categories of risk across the whole of UQ, including controlled entities, and its operations. It demonstrates the Senate and the Vice-Chancellor and President’s commitment to and support for effective and efficient risk management. In addition to the ERMF, more detailed risk management governance documents with additional requirements will exist for certain risk domains, e.g. Health, Safety and Wellness and Information Technology Services. These more detailed risk governance documents are consistent with and give further effect to the ERMF. The RAS is not an exhaustive list that addresses every eventuality, but provides general guidelines. Management and staff are expected to be prudent and apply good judgement in interpreting the RAS to make sensible, risk-based decisions in the best interest of the University and its stakeholders. Risk Categories and their associated appetite statements do not operate in isolation to each other. Decisions will need to be taken with due consideration of all relevant appetite statements. It is acknowledged that in some circumstances the appetite statements may appear to be conflicting. Where this is the case, a trade-off in risk will be required in order to achieve the most beneficial outcome and Enterprise Risk Services (ERS) should be advised. External obligations, budget constraints and the impact of external influences must be considered to determine the optimal treatment plan to manage particular risks. Create and continually enhance a constructive risk management culture in which staff and managers at all levels are encouraged and supported to raise and respectfully discuss risks, issues and opportunities towards beneficial outcomes. Explicitly address “uncertainty” in relation to the achievement of objectives and priorities with a view to reducing the variability of outcomes. Are context-driven (i.e. based on specific objectives). Recognise the impact of human, cultural and environmental factors on University objectives. Are systematic, structured, timely and consistent with UQ’s Governance & Management Framework. Are transparent and inclusive i.e. risk assessment and management activities and decisions include perspectives of all stakeholders, not just management’s. Enable risk management to be an integral part of management thinking, discussions and decision making and help management find the right balance amongst risk, cost and value. Are integrated into all organisational processes, activities and practices including strategic and operational planning, project management and day-to-day operations and that risks are sufficiently documented in relevant plans and reports. Help safeguard assets both tangible and intangible. Protect the integrity of financial accounting and reporting. Are based on the best available information and recognise any limitations with the underlying data. Are dynamic, iterative, responsive to change and continually improving. Are efficient and where feasible, harness technology to support risk management. Facilitate the continual improvement and enhancement of the University. Ensure clarity of roles, responsibilities and accountabilities for effective risk management including monitoring, reviews and provision of assurance on risks and controls. Adopt a risk-based approach to demonstrating compliance including coordination of regulatory and compliance matters across the University. Embed risk management in its investment processes and decisions to help identify, prioritise, assess and pursue viable opportunities in a systematic and disciplined manner. Assess its risks using the Risk Matrix (Appendix D) and record the risks and controls in a risk register (format prescribed in Appendix E). Manage its risks through the design, development and implementation of effective and efficient controls, including General Management Controls (GMCs) as defined in Appendix C. All risks will be managed at a level as low as reasonably practicable and on a legally justifiable and cost/benefit basis with a financial and business outcome focus. Risk management options include (but are not limited to): risk elimination; risk avoidance; risk transfer (through insurance or contracts); and risk retention or acceptance with proper management. Build resilience and requisite capabilities to anticipate, prepare, respond, rapidly recover and minimise adverse impacts from critical incidents, including possible but hard to predict risks. Provide meaningful and useful reports and assurance to senior management and the Senate on risks and controls. Potential systemic, UQ-wide risk exposures and/or risk trends observed by other Functions (e.g. Internal Audit, Integrity & Investigations, Health, Safety and Wellness, Finance and Business, Human Resources) and any material changes in existing risk profiles and controls, are to be advised to Enterprise Risk for consideration in these risk reports. To the extent feasible, integrate risk management and Internal Audit activities by ensuring that Internal Audit’s annual plans and programs of work give sufficient consideration to the primary risks and controls of the University and provide assurance on their effectiveness. Continually review and optimise its risk management function, framework, processes and practices. The Senate is the University's governing body and accountable for the effective and efficient governance of the University. The Senate approves the University's risk appetite. Review the tone and risk culture of UQ, and promote robust discussion around risk appetite and tolerance for risks. Receive reports from the Vice Chancellor’s Risk and Compliance Committee (VCRCC) on management’s identification and assessment of risks to UQ’s strategic and operational objectives and the effectiveness of processes to appropriately manage these risks. Advise Senate on significant issues and changes to the University’s risk profile. Receive annual advice upon the effectiveness of the ERMF, including whether risks are being managed in accordance with RAS. The VCRCC provides assurance to the Vice-Chancellor and President and the SR&AC on the effectiveness of UQ’s risk management and compliance frameworks and practices and on significant risk or compliance issues. In addition to risk and compliance, the VCRCC also provides oversight of assurance, investigations and work health and safety functions. Ensuring their direct reports undertake steps 1 to 5 above for their respective areas of responsibility. UQ’s Top Risks based on Managed Risk Levels (MRL) (i.e. the level of risk remaining after considering the effectiveness of the existing controls or risk treatments) and their management. The effectiveness of the General Management Controls. Management is responsible for effective risk management with the ERS being an enabling function, and Internal Audit providing objective assurance. Under the direction of senior executives and the Senate, the following three cohorts within the University will undertake monitoring and review activities to assess and ensure effective and efficient risk management and controls. While each group has its own monitoring and review objectives and scope consistent with their respective roles in the organisation, there will be ongoing communication and consultation amongst them to ensure effective and efficient monitoring and reviews at each level and avoidance of duplications. Managers will monitor and review their operational activities, risks and controls to ensure effective and efficient performance, governance, risk management and compliance. Monitoring and reviews performed at this level will be the most detailed and generally embedded in the routine processes, procedures and activities of front line operating management. In addition to their ‘Management’ obligations noted above, Heads of Enabling Functions (corporate and academic support services) will monitor and review their function-specific risks across the University and ensure the ongoing effectiveness of the related controls including policies and procedures. Internal Audit is responsible for providing objective assurance over internal controls, including General Management Controls, and risk management practices University wide. Risk owners will record pertinent information and data relating to their risks and controls in the risk register format prescribed in Appendix E.
The key risks of the University based on their Managed Risk Levels (current risk levels) at the time of reporting, including the specific controls managing these risks and any additional proposed controls to reduce the risks to Target Risk Levels (acceptable risk levels). The key emerging risks of the University and what preparatory work or pre-emptive actions (if any) management has decided to take. The key risk indicators based on the RAS for non-negotiables and strategic themes and enablers. The effectiveness of the GMCs per each USMG member and overall at University level. Risk is unacceptable. All reasonably practical and affordable measures to eliminate or avoid the risk must be taken. All reasonably practical and affordable measures to minimise the risk must be taken. A strong preference for strategies and plans with minimal risk exposure. Preferring risk mitigation to the rewards of taking risk. Safe approaches should be taken but the cost of implementing controls should be evaluated to ensure they achieve a worthwhile level of risk mitigations. Can accept a degree of uncertainty in order to achieve an intended outcome providing that reasonable steps are taken to mitigate any potential loss. Recognises that reputation is critical to our brand and market positioning and has a VERY LOW risk appetite for risk in any of its activities that puts our reputation and ‘social licence to operate’ in jeopardy; or could lead to loss of confidence by key stakeholders. Reputation to be assessed in terms of our aspirations as a national and global leader in research and teaching and learning, and as a valued corporate citizen. Maintaining our international rankings as critical in attracting funding, students and academic talent. Has a ZERO tolerance for intentional and material breaches of laws, regulation, statutes and professional standards including those relating to teaching, research and medical ethics. Has a ZERO tolerance for criminal breaches, fraud and corruption, misuse of office or similar related activities. Has a ZERO tolerance for risks relating to actions that may put critical course accreditations and/or standards of operations in jeopardy. A VERY LOW risk tolerance for breach of our privacy obligations to students, staff and other stakeholders. Seeking opportunities to efficiently and effectively meet the requirements of internal policies and procedures. Has a ZERO tolerance for intentional and material breaches of UQ Values and Code of Conduct. Has a ZERO tolerance for unlawful discrimination based on gender, sexuality, ethnicity, culture, etc. Has a ZERO tolerance for violence, sexual misconduct, harassment, bullying, and any other inappropriate behaviour and activities that puts our Culture of Respect in jeopardy. Cultivate a cohesive and positive culture and an operating environment that is performance-based, customer-focussed, entails ethical decision making and helps direct organisational effort, energy and resources towards the promotion, protection and overall success of UQ. Aspires to ZERO harm and is open to innovation and prudent investment in strategies to protect the health and wellbeing of our staff, students and visitors with a focus on the elimination, and if not reasonably practicable to be eliminated, then minimisation of high risk hazards. Has ZERO tolerance for safety management standards or practices that put the health and safety of our staff, students and visitors at risk. Management supporting and leading a strong safety culture and expects employees to take personal responsibility for their own wellbeing. Has a VERY LOW risk appetite for pursuing any strategy that puts at risk the financial sustainability of the University over the medium to long term. Has a LOW appetite for application of capital that is not planned and executed in a sustainable and prudent manner. A MODERATE appetite to increase revenue diversity and net growth activities via international students, research income and revenue from industry partnerships. Seeking opportunities to increase the level of philanthropic support to the University. Has a VERY LOW tolerance for insufficient prevention and preparedness by management to avoid or minimise major disruptions to critical operations. Has a VERY LOW tolerance for significant loss to research including research resources, outcomes (actual or potential) and time. Has a VERY LOW tolerance for irrecoverable delays in teaching & learning activities resulting in semester deliverables not being achieved and/or widespread student dissatisfaction due to unfavourable changes as a result of the disruption. Has a VERY LOW tolerance for significant operational disruptions to critical support/enabling operations and functions. Has a HIGH appetite for a comprehensive, coordinated and focused approach to effectively respond to and efficiently recover from disruptive incidents. [a] This column provides further guidance supporting the Principle statement(s) and / or provides more specific statements where appropriate. In addition to the above ‘non-negotiables’, the following statements provide guidance that will help in making risk-based decisions. Has a HIGH appetite to establish a collaborative, collegiate, performance-focused, agile and flexible culture that will enable organisational change to happen more readily and productively. Has a HIGH appetite to realise the benefits of diversity across gender, culture, ethnicity, etc. in our student and staff cohort. Subject to maintaining exemplary quality and ethical standards, the University has a HIGH appetite to engage in research activities where there is a reasonable likelihood of achieving a positive outcome for external partners, researchers and the University. Subject to maintaining exemplary academic and ethical standards, the University has a HIGH appetite to develop and deliver programs, courses and modes of delivery where there is a reasonable likelihood of achieving a positive outcome for the University, for students and future employers of our graduates. Has a HIGH appetite to maintain the quality of our student intake. Has a MODERATE TO HIGH appetite to leverage capacity and capability via internal and external partnerships, where this contributes to our strategic priorities. Has a HIGH appetite to support strategies that build and sustain the appropriate culture, capabilities and resilience of our people. Subject to cost and affordability considerations, has a HIGH appetite to recruit, retain and develop the best quality staff for all research, teaching and operational roles. Has a LOW risk appetite to tolerate staff under-performance and expects management to take timely action whilst ensuring that staff are provided with reasonable opportunity and support to improve performance. Recognises the critical need to protect and has a VERY LOW risk tolerance for activities, events or behaviours that adversely impact on the confidentiality, integrity and availability of all critical business information. Has a HIGH appetite to invest in innovative solutions that increase efficiency in systems and processes across both academic and enabling activities. Has a ZERO tolerance for substandard campuses that do not meet applicable legal and regulatory compliance requirements. Has a HIGH appetite for optimal utilisation of assets and for their proper maintenance. Actual and potential benefits – donations/endowments, support, etc. The GMCs are inherent to the general management functions of leading, directing, planning, organizing, staffing, coordinating and controlling any organisation. These controls form the foundations of the University’s internal control system and help provide a robust, systematic and perpetual defence against threats to achieving the University’s objectives. The GMCs should be implemented and assessed for their effectiveness at the UQ level and any of the lower levels including faculties, schools, institutes, controlled entities, functions, divisions, teams and projects. Have the objectives and strategies been clearly defined, aligned, prioritised and communicated to those who need to know? Have the primary stakeholders been identified and strategies put in place to recognise and protect their rights and develop respectable, equitable and mutually beneficial relationships with them? Does the organisational structure facilitate the effective and timely implementation of the strategy and the monitoring, measuring and reporting of performance? Are there approved plans and budgets for all objectives, strategies, initiatives/projects and have these plans and budgets been communicated to those who need to know? Are the roles, responsibilities and accountabilities for the delivery of prioritised objectives and outcomes clearly articulated and assigned to individuals or teams? Are the management and other pivotal/critical roles staffed by competent people? Do managers and staff have appropriate authorities/delegations and mandate to achieve the objectives/outcomes expected of them? Do managers and staff behave in accordance with UQ Values and the Code of Conduct? Are processes and protocols in place to protect people from harm? Is there a robust process in place to demonstrate compliance with applicable laws and regulations and are regulatory breaches (if any) recorded, reported and promptly rectified? Is there effective security over assets including systems, information and vital records? Are performances against KPIs and plans measured, monitored and reported on and timely actions taken to remedy any gaps in performance? Are there controls in place to ensure responsible, sustainable use and management of University resources including natural resources? Are records and reports required for business and/or legal/regulatory reasons produced and are they relevant, reliable and timely? Are there robust plans and processes in place to ensure continuity of business-critical operations? Is there effective supervision, monitoring and reviews of the performance of staff, systems, processes and controls and prompt remediation of any unfavourable variances? Does management provide assurance, through its own reviews and assessments, to demonstrate effective and efficient performance, governance, risk management and compliance? Note 3: Accountability refers to the decision maker’s obligation to explain the use of delegated authority towards the achievement of agreed objectives and outcomes. Responsibility refers to the obligation to perform specific actions, under the instruction of and/or for the accountable party, towards the achievement of agreed objectives and outcomes. ERMF – Enterprise Risk Management Framework. RAS – Risk Appetite Statement. ERS – Enterprise Risk Services. GMCs – General Management Controls. IRL – Inherent Risk Level (It is the level of risk assuming there are no controls specifically designed and implemented to manage that particular risk). MRL – Managed Risk Level (It is the level of risk taking into consideration the total effectiveness of all the existing controls or risk treatments that act upon that risk). 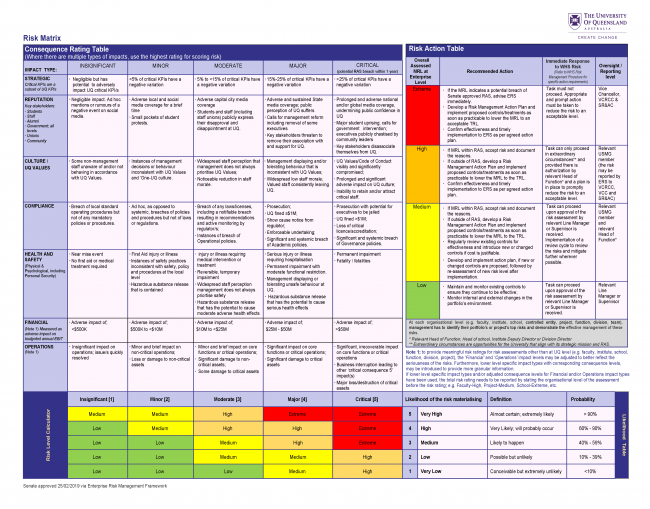 TRL – Target Risk Level (It is the desired (or acceptable) level of risk considering the University’s risk appetite and tolerance levels, to be achieved via implementation of proposed controls). SR&AC – Senate Risk and Audit Committee. VCRCC – Vice Chancellor’s Risk and Compliance Committee. USMG – University Senior Management Group. A wide and very large scope of activities and services related to both teaching and research. Off campus activities and services both in Australia and abroad. Large number of buildings, facilities, research equipment and other infrastructure. Involvement of many people; staff, students, visitors and wider community. Given this large scope of influences and dependencies impacting the university’s daily operations, business interruptions are likely to occur from time to time. Disruptive incidents often result in a localised operational disruption only but sometimes can cause a critical incident when multiple areas are negatively impacted requiring a coordinated response, or in very rare circumstances result in a crisis where a strategic executive response is required. The purpose of this procedure is to ensure that the university builds adequate resilience and requisite capabilities to anticipate, prepare, respond, rapidly recover and minimise adverse impact from disruptive incidents, including hard to predict disruptions. It takes into consideration potential impacts of a disruptive incident to people, assets, the local community, the environment and UQ’s reputation. This procedure applies to actual or potentially imminent adverse incidents and events impacting on UQ, including its controlled entities. Anticipate threats to UQ’s strategic objectives. Develop capabilities to prevent, prepare for, promptly respond to and rapidly recover from events that disrupt and threaten UQ. Empower and develop the capabilities of individual leaders to manage disruption events and threats. Integrate all levels of incident, risk and disruption management to create a consistent and enterprise wide approach. Build on and support existing organisational knowledge, skills and systems to ensure practical adoption of business resilience and critical incident management principles and capabilities. UQ has adopted the PPRR (Prevention, Preparedness, Response, and Recovery) comprehensive approach as the process for managing all phases before, during and after disruptive incidents. The approach is continuous and all managers must understand and perform their roles and responsibilities related to all four phases of the process. UQ has a tiered enterprise incident response structure to ensure an integrated, scalable, enterprise wide and consistent response to disruptive incidents. The structure applies to all university operations and activities. 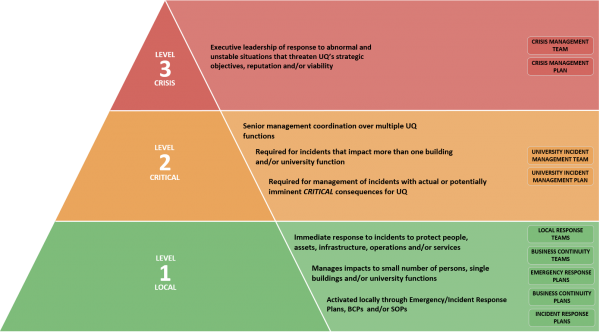 An incident response can initially be activated from all levels within the response structure (refer figure below). Once activated the response structure operates hierarchically. 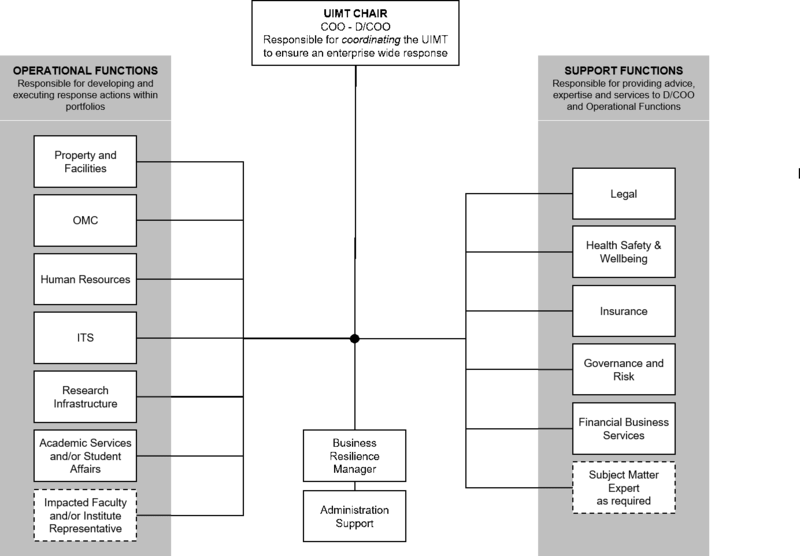 Their individual roles and responsibilities within the structure. Teams, plans and procedures to be activated at each level. Their responsibility to report and/or escalate incidents to the next level above. Incident assessment is a key component of incident management and ensures the appropriate level of response is activated. Incident assessment must occur prior to activating a response at any level within the incident response structure. Incident assessment at UQ is based on a combination of 10 key trigger incidents and critical consequences defined by the UQ Enterprise Risk Matrix. Assessment of actual or potentially imminent consequences. Required notifications and escalation of incident. Required activation of teams, plans and processes. Responsible for immediate response to incidents to protect people, assets, infrastructure, operations and/or services. Local response managers are responsible for the direction of their staff and resources. Utilise emergency response plans, incident response plans, business continuity plans and standard operating procedures to respond. Report up to relevant senior manager and the UIMT (if activated). Responsible for senior management control and coordination over multiple UQ functions and ensures an adequate enterprise wide response to incidents. Operates under the requirements of the University Incident Management Plan (UIMP). Reports up to the Crisis Management Team (if activated) and coordinates down through the LRTs. Team composition is scalable and flexible and determined by the incident response assessment. See appendix 7.1 for UIMT basic composition. Responsible for providing executive leadership in response to abnormal and unstable situations that threaten UQ’s strategic objectives, reputation or viability. Sets the strategic objectives of the response and recovery. Communicates with the Senate and is focussed on the medium to long term impacts. Directs down through the UIMT. Operates under the requirements of the Crisis Management Plan (CMP). See appendix 7.2 for CMT basic composition. Plans detail and structure response and recovery actions and tasks. They exist at all levels of the incident response structure and are developed, practiced and tested during the preparedness phase. Informs and structures the VCC response to abnormal and unstable situations that threaten UQs strategic objectives, reputation and/or viability. The CMP is developed, implemented and maintained by Enterprise Risk Services on behalf of the COO. Coordinates and guides the senior management response to incidents that impact more than one university function, critical building and/or essential service. The UIMP is developed, implemented and maintained by Enterprise Risk Services on behalf of the D/COO. Informs and structures timely, consistent and accurate messaging that supports strategic and operational objectives. The CRP is developed, implemented and maintained by OMC. Details and structures local and immediate response to protect people, assets, infrastructure, operations and/or services. LRPs are developed, implemented and maintained by all functions. Details and structures tasks and actions to ensure critical business functions are maintained during and after critical incidents. BCPs are developed, implemented and maintained by all functions, faculties and institutes. Managers should have an understanding of the plans which they are responsible for and where they fit within the response structure. During the response to an incident, individuals and teams can quickly become overwhelmed by a complex and dynamic situation. A key principle to overcome these circumstances is to prioritise and execute actions and tasks in order of importance. This ensures an appropriate, methodical and consistent response that creates time and space for managers. UQ has predefined the response priorities which will need to be followed by all managers and teams when responding to all incidents. Students, staff, visitors and the public. Critical services, facilities and/or utilities and underlying infrastructure (e.g. electricity, water, transport, communications, security systems and/or information and information technology). Assess and determine actual or potential breaches of law, regulations, contract, governance and or critical licence and/or accreditation. Check for available insurance response options and requirements. Ensure accurate and timely information is provided to key stakeholders and media to ensure their trust and confidence in UQ. The ERS team will conduct an annual review of the effectiveness and implementation of this procedure and provide a report of findings and recommendations to the VCRCC. Progress and effectiveness of implementation of the Incident Management Procedure throughout UQ. Analysis of what happened, why it happened, and, what worked well, what didn’t work well and recommendations on how it can be done better. Outline of training/ exercise conducted.